Royal Caribbean International has been approved for a summer and fall series of calls at Havana with Empress of the Seas, and they have now opened them for sale. In December we reported a fifth woman, who worked for the DC Public Schools, had been arrested. She had apparently recruited the first woman and coordinated the whole thing. She has now decided to plead guilty to being the mastermind behind the whole thing. It used to be cruise lines would announce a new ship and then reveal all its wonders. As the ships became larger, cruise lines began to split the announcements up and began to have a series of reveals. That device has begun to lose its luster, and now Celebrity Cruises has a new way to breathe some life back into the series of reveals: the Design Ambassador. Construction of the 154,000-ton MSC Seaview began today at the Fincantieri shipyard in Monfalcone when the first block of the keel was laid in the dry dock. 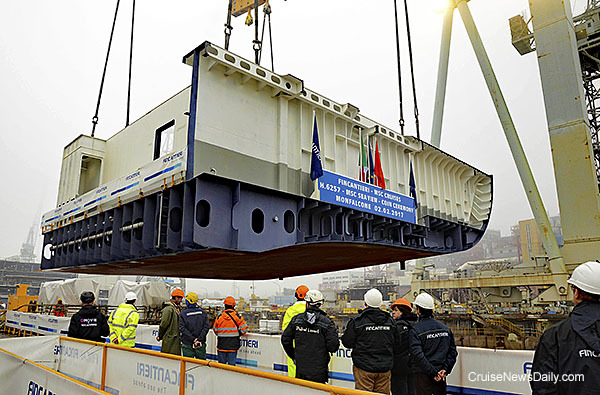 The first block of MSC Seaview is lowered into place at Fincantieri's Monfalcone yard. “Good Spirits” is not about friends of Casper the Friendly Ghost. It's a new series Carnival Corp is producing for the A&E Networks about cocktails. Really. Are cruise passengers being affected by the president's executive order restricting entry into the US of some foreign nationals? 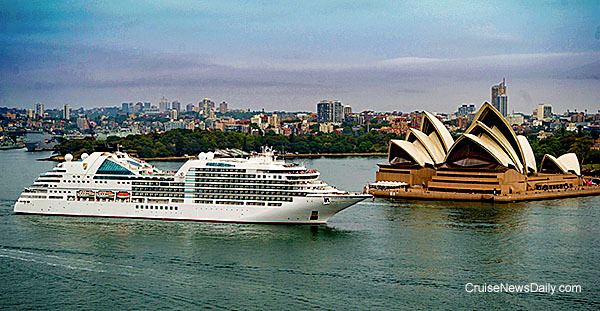 Seabourn Encore makes its maiden arrival at Sydney this morning. Photo courtesy of James Morgan and Seabourn Cruises. All rights reserved. May not be copied or used without express permission. Carnival Cruise Line has expanded their Seafood Shack, which debuted aboard Carnival Vista, to seven additional ships. The casual, a la carte restaurant is located within the ships' Lido buffet restaurants. Norwegian has added perks across many levels of their Latitudes loyalty program, and they have added two new top levels for their most loyal customers. The wheels of justice turn slowly. About a year ago when a couple of men went to court in South Florida, we told you about a serious situation that developed a few months earlier when a family sailed aboard Independence of the Seas with their 11-year-old daughter. Things didn't go too well, and the man was back in court last Friday for sentencing for, in a way, defending his daughter's honor. Carnival Ecstasy has returned to Charleston but looks different from when she left. The ship has four new drinking and dining venues after a two-week multi-million-dollar dry dock. The new venues are all still part of the FunShip 2.0 program, so they are familiar to those of us who watch the Carnival fleet, but they are some of the most popular and will be exciting to people who sail from Charleston (almost) exclusively.